Easy, fuss-free recipes from Giada De Laurentiis, Serena Wolf, Cassy Joy Garcia and more are your new weeknight dinner solution — and require almost no cleanup! From baking cookies to roasting veggies to toasting nuts, the sheet pan is a kitchen workhorse. It’s incredibly easy to use and, assuming you’ve invested a few dollars in a sturdy, good quality version, it never lets you down. But sheet pans can be used for so much more than cooking part of dinner or baking your famous snickerdoodles. With the right recipe, a sheet pan is all you need to get a complete and satisfying supper on the table with very little prep and next to no cleanup. Now that’s a formula for successful weeknight eating. For inspiration, we asked a few of our favorite food pros, including Giada De Laurentiis, Cassy Joy Garcia, Serena Wolf, Sara Lynn Cauchon, Marge Perry and David Bonom to share their best ideas for cooking dinner using just a sheet pan and a hot oven. So, the next time you need a fuss-free meal — maybe even tonight —pick a recipe and put your trusty sheet pan to work. “I love that this sheet pan meal is light yet satisfying, packed with flavor and nutrients and comes together in a flash with next to no cleanup,” says Serena Wolf, the blogger behind Domesticate Me and author of "The Dude Diet: Clean(ish) Food for People Who Like to Eat Dirty" and the upcoming "The Dude Diet Dinnertime: 125 Clean(ish) Recipes for Weeknight Winners and Fancypants Dinners." Cooking salmon in the oven yields tender, flaky fish every time, explains Wolf. “Salmon, crispy broccoli and tart-sweet oranges are a winning combination, but the mustard-spiked, Asian-inspired dressing takes things to the next level by adding unexpected umami flavors into the mix.” Feel free to sub your favorite white fish for the salmon and note that this recipe can easily be halved to serve one or doubled to feed a family or guests. 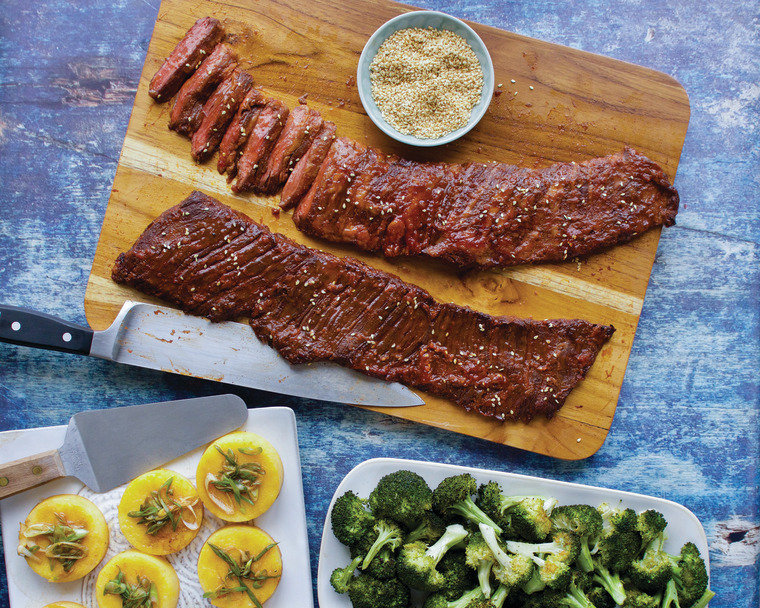 Korean-inspired skirt steak with polenta and broccoli is “a surprising combination, but one that works incredibly well,” explains Marge Perry, co-author with David Bonom, of "Hero Dinners: Complete One-Pan Meals That Save the Day." Though they originate from different parts of the world, “the mildly nutty creaminess of the polenta balances really well against the slightly spicy, pungent fermented flavor of the gochujang and the chewy meatiness of the steak.” Best of all, the process is equal parts easy and genius. The polenta and broccoli are cooked directly on a sheet pan, while the steak sits on a rack above. This clever technique allows the meat to brown on the outside yet stay medium rare inside. Plus, it protects the polenta and veggies from the oven’s high heat and lets them absorb some of the meat’s yummy juices. Clambakes typically require digging a hole at the beach and tending a fire for hours, but with Perry and Bonom’s sheet pan version, you can enjoy the clambake experience without ever leaving the kitchen—and with very few dishes to clean up afterwards. Perry and Bonom’s recipe combines clambake essentials — clams, shrimp, corn and potatoes — with zucchini and red onion, plus a sprinkle of Old Bay. “We ensure every ingredient is at its best by adding them in stages, so they all end up cooking to the ideal degree,” explains Perry. The shrimp and clams steam with the vegetables and pick up some of their sweetness, while the veggies “are seasoned with the flavors of the sea.” The recipe takes about 30 minutes from start to finish and since it’s cooked in the oven, it’s truly a year-round meal.